Yes, I'm Pregnant. And Riding My Bike. Pregnancy has simultaneously heightened my commitment to biking. It has served as a source of sanity that has helped usher me through the pains and challenges of the past nine months. 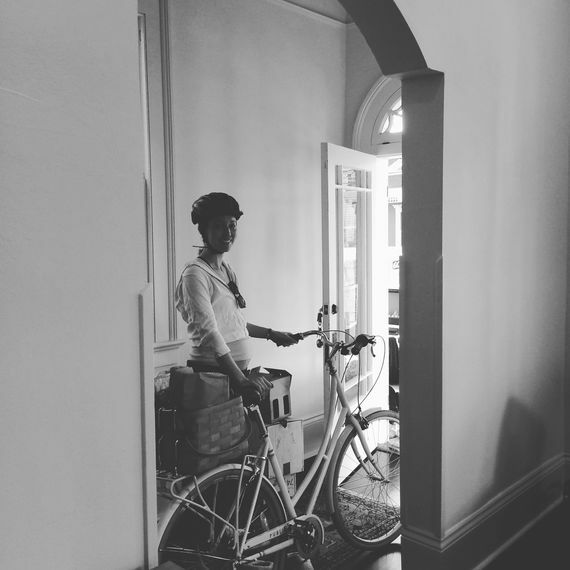 Urban planner and writer living in New Orleans. "You're 8 months pregnant! Can you please stop riding your bike?" my concerned co-worker pleaded with me on a recent Friday. As we headed to lunch in her car, she'd spotted my bike glinting in the sunlight, conspicuously tethered to a signpost in front of our office. "Actually," I corrected her, thinking back to my idyllic ride into work that morning, propelled in part by the most beautiful weather of the year, "more like 9." Being pregnant with my first child has caused me to alter lots of things about my lifestyle. I've given up alcohol, Diet Coke, bean sprouts, sleeping on my back, most of my skincare routine, and dyeing my hair. Despite my pre-pregnancy fantasy of becoming a single-car household, I recently traded in my 20-year-old Honda for a new one with a functional air conditioning system and side airbags. I've set aside money once reserved for travel for a baby and maternity leave fund. I've obsessed over cribs, car seats and pricey organic baby mattresses, opting for those achieving the highest rankings for safety and the lowest for toxicity. All of this in the name of protecting the tiny resident of my womb. Still, one thing I haven't changed is my willingness to ride my bike. I should say that, as American bike commuters go, I'm among the lucky ones. The 5 miles I ride between my home and my office is a manageable distance rendered far more feasible by the bike lane installed a few years ago along the tree-lined boulevard that runs near my New Orleans home. That bike lane takes me directly into City Park, whose low-stress streets carry me most of the way to the office. I benefit from a concerted effort on the part of city officials in the wake of Hurricane Katrina to make my hometown more bicycle-friendly. Thanks in large part to an influx of federal recovery money, New Orleans' bikeway network has expanded from roughly 11 miles before the storm to around 100 miles today. My city's pre-car origins also carry inherent advantages for anyone interested in getting around by non-motorized means, and the past several years have witnessed substantial growth in the city's bicycling ranks to the point where we now stand among the top 10 large cities in the country for the rate of people commuting to work by bike. If I lived in the far-flung suburbs, or even in a less bike-friendly part of my own town, I would be far less apt to consider my bike a viable transportation mode. Believe me: I have no death wish for myself or my unborn child. The dangers associated with biking are something that I think about every time I get on my bike. And actually, this is true no matter the condition of my uterus. Commuting by bike is, for most of us, an unfortunate tradeoff between what is clearly the most healthy, mentally-fortifying, economical and environmentally-friendly mode of travel and the reality that we are subjecting ourselves to a certain degree of risk by virtue of the car-centric composition of mine and most other American cities. At this point, I've grown accustomed to raising eyebrows over my choice to bike while pregnant. At our recent baby shower, a gaggle of relatives staged a well-intentioned if misguided mini-intervention with my husband as I stepped unsuspectingly outside. "You have to get her to stop biking," he later told me that they urged him. "Have you met my wife?" my husband astutely responded. "You think I'm really able to tell her what to do?" Not that their concerns fall entirely on deaf ears. My protective pregnancy hormones in full swing, these days I find myself tweaking my bike commute in an effort to minimize the dangers. I've cut back on my riding and feel good if I make it into work on my bike one or two days a week. I'm especially averse to biking after dark when I worry I'm less likely to be seen. I take low-traffic streets where possible, especially on the way home from the office when I find that drivers are much more impatient than they are on their way into work when they seem more than happy to obey the speed limit. I'm vigilant about my lights being charged in case I do wind up traveling in a dimly-lit situation, and, of course, I always wear my helmet. But pregnancy has simultaneously heightened my commitment to biking. It has served as a source of sanity that has helped usher me through the pains and challenges of the past nine months. Although mine hasn't been one of those vomit-laden slogs that I read about in friends' Facebook feeds, there have been some hiccups along the way. I was forced to abandon my running routine after throwing out my back a couple months ago (an eye-opening experience that afforded me a brand new empathy for people with limited mobility). For someone quite addicted to the effects of regular exercise and who had been counting on an active pregnancy as a means to a healthier baby and smoother delivery, I spent a torturous few weeks wishing that crawling were an acceptable means of getting around the office and longing to be able to walk normally again. During this period, however, I discovered that biking, unlike walking, was doable with relatively little pain. It's also strengthened my resolve that we as a society have to do much more to reverse the transportation paradigm that reigned for the past 100 years. More than ever, I believe that the roads should be safer for everyone and that every woman, man and child should be able to bike to work or school -- or cross the street safely -- without being strapped into a car. Believe it or not, there are places where this is already the norm. So how do we get there? It won't be easy. One thing we can all do is take to the streets and encourage others to join us in the bike lane. More bicyclists on the roads make the streets safer for everyone. In places with strong levels of bicycling, drivers are more aware of and cautious around bicyclists and are more likely to be bicyclists themselves. And riding a bike, even occasionally, it seems, has the effect of almost instantaneously turning drivers into far more aware, considerate and understanding motorists. City leaders, confronted with large bicycling ranks, are more likely to commit to providing the types of amenities that make bicycling safer and more attractive. And seeing more variety in the types of people biking the streets has to have a positive effect in influencing new people to take to two wheels. I hope that a pregnant woman in the bike lane underscores to others on the road that those of us out riding our bikes are not just some inconvenient obstruction deserving of scorn but rather people who come from all walks of life who are simply trying to get where we need to go. Women are often said to be an indicator species as to the relative safety of cycling and tellingly, we make up only about a quarter of all bike commuters in this country. 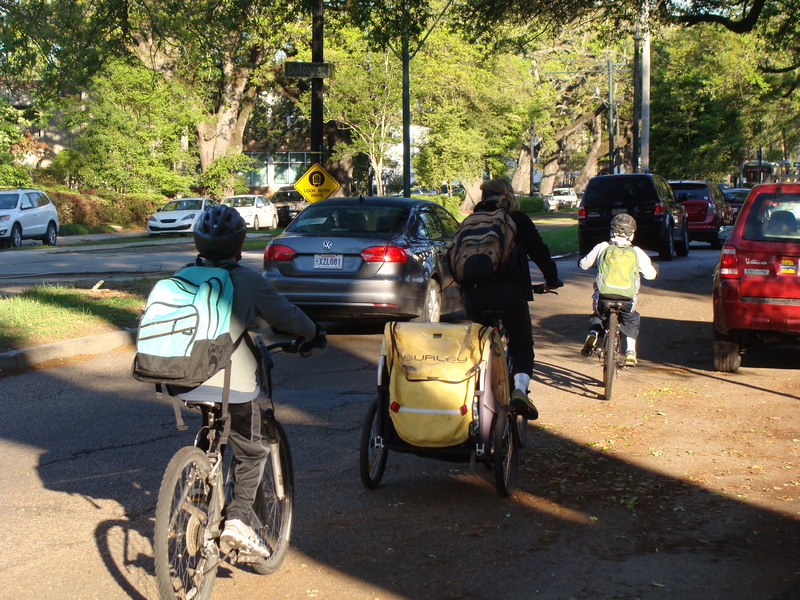 If women in general are an indicator species, it seems to me that women biking with children (or with child in utero) are the ultimate litmus test of a city's cycling hospitality. Although I can't say I've encountered many (ok any) other obviously pregnant women in the bike lane since the onset of my pregnancy, I do notice an increasing number of women on bike in my city, and a surprising number of women - and men - pedaling around with children in tow, which I think speaks volumes about the rapidly-changing transportation landscape. I look forward to the day when I can tell my child about biking with him or her in my belly, and I hope he or she is surprised to hear that this wasn't very common at the time. I also hope my kid will be proud of the fact that his mom wasn't the lying-on-the-couch-eating-bonbons type of pregnant woman and in knowing that maybe, just maybe, the two of us helped to shift the public consciousness if ever so slightly in the right direction. Meantime, as I bike to work lately I must admit some satisfaction in the surprised expressions of passersby as they notice my distended belly. "Yeah," I think to myself, "I'm pregnant and riding my bike. What's your excuse?" Emilie Bahr is the author of Urban Revolutions: A Woman's Guide to Two-Wheeled Transportation, now available at www.urbanrevolutions.com. This post originally appeared on the blog at BikeShopHub.com.